We have 30 days left to save what is left of economic sovereignty in Ireland, 30 days to ensure that the Fine Gael/Labour Government does not succeed in putting failed austerity policies into the Constitution, 30 days to defeat an Austerity Treaty that means more cuts, more stealth taxes, more unemployment and more emigration. The campaign has hardly begun and already the 'Yes' side are resorting to their customary threats and bullying. This afternoon Finance Minister Michael Noonan threatened an even more savage budget in 2013 if the people vote 'No'. The big stick being wielded by the 'Yes' side, of course, is that if we vote 'No' we will not have access to further emergency funding from the European Union. Where does this threat come from? The Government says this is in another Treaty, the ESM Treaty. But the fact is that this Treaty has not yet been approved by the Irish Government and has not come into effect. This ESM Treaty, if approved, would make ESM funding conditional on us approving the Austerity Treaty. So, the threat is a bogus threat because the Government itself has the ability to block and veto the very source of the threat - the proposed ESM Treaty. Yet this Fine Gael/Labour Coalition wants the ESM Treaty to go ahead as is and to get the people to approve the Austerity Treaty. It's crackers. Did they not even consider delaying the referendum until later this year in order to get a better deal? The Treaty may well be changed anyway as there is growing opposition to it across Europe. And it is far more likely that it will be changed or scrapped altogether if we vote 'No'. But if we vote 'Yes' we will be tying this Government and future Governments to austerity policies of drastic cuts to public services and huge tax increases for many years to come. How could a Government be so submissive and so incompetent as to take such a position? Where was their backbone? The truth is it was removed years ago. Fine Gael and Labour have been bowing the knee to Brussels to decades. They never question anything that comes from the European Commission or the powerful EU member states. Remember the Lisbon Treaty when they told us 'Vote Yes for Jobs'? Where are the jobs? I believe their submissive attitude goes far deeper, especially in the case of Fine Gael. There is within Fine Gael a strand of slavishness that goes back to the days of the West Britons, people who bent the knee to the British when they ruled Ireland from Dublin Castle. That was confirmed last weekend when a former Taoiseach and Fine Gael leader, John Bruton, unveiled a plaque at Woodenbridge, Co. Wicklow. Incredibly, this plaque was to commemorate the place where in 1914 Irish Parliamentary Party leader John Redmond made a speech urging the Irish Volunteers to join the British Army. Thousands did so, persuaded by Redmond to fight for the British Empire and then dying in a futile war between the kings, warlords and capitalists of Europe. There was always a Redmondite strand in Fine Gael but what of the Labour Party that claims the legacy of James Connolly? They are on the coat-tails of Fine Gael, once again urging the Irish people to abandon their rights and sacrifice themselves for the good of the wealthy and powerful in Europe. Give them all their answer - Vote 'No'. 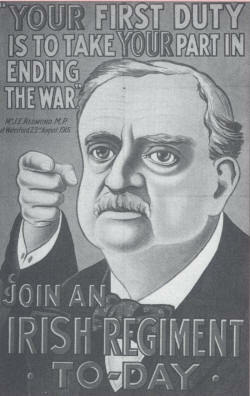 John Redmond urging the Irish to join the British Army.